When it comes to language learning what would you consider an essential skill to improving your Chinese? Take you time to think about this. Could it be improving your accent? Moving to China? If you thinking along the lines of vocabulary you are correct! You see, if you’ve been taking Chinese classes regularly by now you may have mastered the basics of Chinese language. You can most likely hold a simple conversation with your classmates or teacher about day-to-day activities, interests, or common topics. However, go outside any of these topics and you find yourself struggling. Your Chinese vocabulary is probably to blame! Starting to sound familiar? The biggest step you can make to improve your Chinese is to learn Chinese vocabulary that goes beyond class material. Otherwise you will be forever stuck in the same language patterns, which can leave you sounding like a robot. Whenever I think about this topic I always remember Sheldon from the TV show The Big Bang Theory. If you are a fan of the show you might remember the episode where Sheldon decides to learn Chinese. If you aren’t sure what episode I mean you can find it on YouTube by searching for ‘Sheldon learns Chinese” . What I love about this episode is that it became extra funny because I realized the Chinese is completely right! It starts off by Sheldon forcing Howard to teach him using a language book. It gets funnier as he interacts with native speakers making mistakes due to his lack of vocabulary. The funniest has got to be when he is trying to argue with the Laoban (the boss) at the Chinese restaurant. If like Sheldon, you want to improve your Chinese vocabulary to be able to converse fluently about a whole host of topics. Then this is the place to start! I know that not everyone has the luxury to move to China and fully immerse themselves in the environment, so this is the next best thing. Guess what? You don’t even have to leave the comfort of your own home! We will use Sheldon as an example, if he had come to our Lingo Bus blog for help here’s how he could have beaten the restaurant Laoban. More tips to learn Chinese words. The following characters are crucial when it comes to talk about eating but may not be taught in beginner classes. 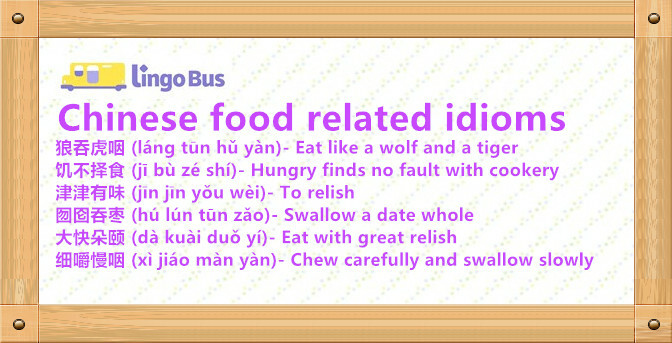 If you are a foodie or interested to learn Chinese vocabulary that is food related, then look no further. e.g.来尝尝 (Lái cháng cháng)-Come have a taste. You can use this phrase to encourage others to come have a bite of your yummy food. Or if you want to relate it to a specific food item美味的羊肉串，来尝尝吧！(měi wèi de yáng ròu chuàn，lái cháng cháng ba! )- Delicious lamb kebabs, have a taste! e.g. 咀嚼（jǔ jué）Chew the food slowly in your mouth. You can use this to emphasize that the food is good so you take extra time to savor it. Or in a sentence咀嚼大量的口香糖不利于你的牙齿健康 (jǔ jiáo dà liàng de kǒu xiāng táng bú lì yú nǐ de yá chǐ jiàn kāng)- Chewing a lot of gum is bad for your teeth. e.g. 喝水（hē shuǐ）Drink water. You can use this phrase to describe that you or someone is drinking something by adding 喝 in front of the liquid. In a sentence, 喝水有利于身体健康 (hē shuǐ yǒu lì yú shēn tǐ jiàn kāng)- Drinking water is good for your health. e.g. 吞咽（tūn yān)-To eat food fast. You can use this phrase to describe someone that eats food very fast. But if you really want to sound like a native speaker and improve your Chinese vocabulary then I suggest you add some idioms to your vocabulary. In China idioms are used very frequently in conversation, hence why it’s such a huge part of the HSK exam. Because it’s an essential part of Chinese communication. This may sound strange if you heard it mid sentence when talking about food! But it means to gobble up or ‘wolf down’ your food, get it? Basically means when you are hungry you eat what is available! This idiom is often mixed with another meaning, when hungry you eat what you can, when cold you wear what you have. You can use this when you really enjoy your meal, it can also be used to describe something you are doing that you really take pleasure in. Dates are a very typical snack or ingredient in many Chinese recipes. They can be eaten in porridge or added to tea for flavor. This idiom means to swallow with one gulp. It can also be used to mean you accept something without thinking. It basically means to eat heartily or to gorge yourself on yummy food. I think this one is self explanatory, it means you need to eat at a slower pace and enjoy your meal! Now that you have this vocabulary you need to practice using it and memorizing it. Most Chinese beginner books will have a Chinese text with translation. Use this by breaking down the sentence and working out how the placement differs. You can do this to the vocabulary list we provided and try to create new phrases using that word. Online dictionary formats like Pleco will give you more information on what type of word it is and further uses. Although textbooks are useful what you really need is access to a native speaker if you want to improve. Native speakers can be hard to come by though. Plus, it often means leaving your house. I did promise you could improve your Chinese vocabulary without leaving your house. That’s why I suggest apps like HelloChinese and their food items unit to ensure you have the basics right. It works by mixing listening, writing, and speaking. It’s great because you can see straight away where you have made mistakes. If you want to continue your practice, then I also suggest Hellotalk where a native speaker will correct anything you post. This way you can practice the vocabulary you have learnt in different ways. If you want to tie it to your listening skills and practice commonly used phrases, then I suggest watching movies. If you like old movies, then I suggest “Eat Drink Man Woman” from 1994. It follows the relationship of a chef and his three daughters, there’s plenty of food vocab to learn. For a more modern film then, “Chongqing hotpot” (2016) a comedy about friends who open a hotpot restaurant that turns out leads to a bank vault! There’s a reason why we say ‘use it or lose it’! Reviewing little and often will help you to expand and retain any new Chinese vocabulary. As I’ve mentioned before, learning Chinese is like going up a mountain on skis. Once you stop moving forward you quickly go back down the hill! I suggest using flashcards packs that you can quickly check even when on the bus to work. If you have children aged between 5 to 12 years old, then the Chinese language app from Lingo Bus has all the features mentioned above! 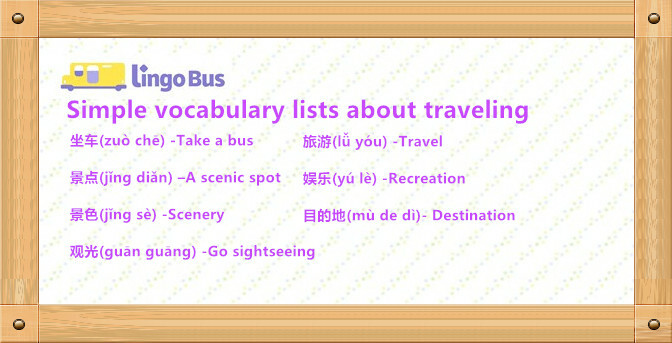 Lingo Bus provides Native speaker taught 25 minute classes with preview and review functions to help retain learnt vocabulary. The app also has a book library filled with top age appropriate literature, a flashcards function, videos, activities, and many more. I’m sure that if Sheldon had access to our Lingo Bus blog I’m sure he could have beaten the Laoban at the Chinese restaurant! I hope this blog will have introduced some ways you can learn Chinese vocabulary. Keep your eyes pealed for more to come! REMEMBER that if you want to expand on your good work, then you need to continue to learn Chinese vocabulary. The best way to do this is to find a topic that interests you and then expand your vocabulary! I’m a visual learner so I like to make learning as interactive as I can. When a new topic interests me I create mind maps. I start by writing down the vocabulary I know in the center of a large sheet of paper. From there on I start expanding by writing subcategories in English that I then search for in Chinese. Then I like to use the app Quizzlet to create flashcard packs so that I can always revisit that topic. The good thing about apps like this is there may already be some pre-made topic packs available from other users. This is great if you aren’t sure about where to begin and need some inspiration. 游山玩水 (yóu shān wán shuǐ) -A sightseeing tour. 游人如织 (yóu rén rú zhīǐ) -To be crowded with visitors. 优游自在 (yōu yóu zì zài) -Be completely free and at ease.